One thing that makes Alaska unique is that all three species of North American bears flourish here. 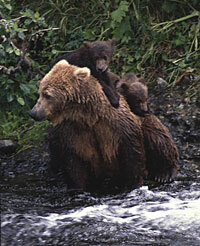 It is not uncommon for residents or visitors to Alaska to see bears, usually from a safe distance. But even if you don't see a bear, you will never be far from one; Alaska is bear country. By learning about the lives of black bears, brown bears (including grizzly), or polar bears, you will enhance your enjoyment of these species and help minimize human-bear conflicts. Whether you are learning about bears for the purpose of hunting, viewing, traveling safely, or deterring bears from your property, the more you know the better. Living in a state with large predators comes with responsibilities. In order to maintain healthy bear populations and reduce conflicts with bears, certain precautions should be taken. Whether it is keeping the garbage at your home secure, or maintaining a clean campsite, your behavior often dictates the bear's behavior. Learn more about living and camping in bear country on these pages so that you, and the bears, can live safely together. Report dangerous bear situations to ADF&G using the wildlife encounter form. If you want to speak to an ADF&G staff person, contact your local area office. 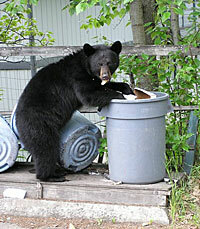 Living with bears requires that people keep all human sources of food secure from bears. The following pages provide useful tips to help keep bears wild and people safe. If you encounter a bear, how you behave often dictates the outcome of the encounter. Even though encounters with bears are not common and aggressive bear encounters are rare, the more you know about bear safety the better off you are. Learn about safety in bear country on these pages. Get the facts and dispel myths so that you can enjoy the outdoors with confidence and competence. Print at home using 8.5x11" paper landscape format, side staple or corner staple. Educators: For multiple copies, contact the DWC Wildlife Education program. Safety for Kids — Bear Aware Coloring Book (2003 version) (PDF 1,080 kB) This version has fewer words, so may be a better choice for younger children. The Safety in Bear Country Society, in cooperation with the International Association of Bear Research and Management, has developed four excellent videos/DVD's about staying safe in bear country. Copies are available on loan from ADF&G Area Offices in Anchorage, Fairbanks and Juneau or you may search online to order copies. HEY BEARS! How YOU Can Stay Safe in Bear Country. This 19-minute video, produced by ADF&G with Wayne Hall-Stoutman Productions and Mirror Lake Middle School, teaches elementary-age students about basic bear safety including tips for avoiding bears, minimizing attractants around homes and camps and what to do if you see a bear. Bear Spray Demonstration for Hunters, with Craig Boddington. This 60-second video demonstrates the proper use of bear spray. Learn more about the lives of urban bears, and see Anchorage from a bear's perspective. This Story Map shows data from an ADF&G research project that tracked nine bears using GPS collars that included a video camera. Look at these web pages to find out what you can do to deal with problems with bears. Questions or concerns? Contact your local area office. Alaska has several interagency or community groups across the state aimed at minimizing human-bear conflicts and increasing bear awareness among residents and visitors to Alaska. The Alaska Department of Fish and Game often leads these committees, or is an active member of them. Contact the Wildlife Education Program Coordinator, 907-465-8547 if you are interested in learning more about these community partnerships. 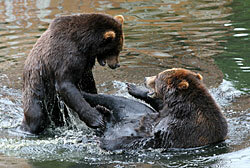 To find out about upcoming public programs on bear awareness/wildlife safety, visit our calendar. Want to reach ADF&G biologists about a wildlife encounter?